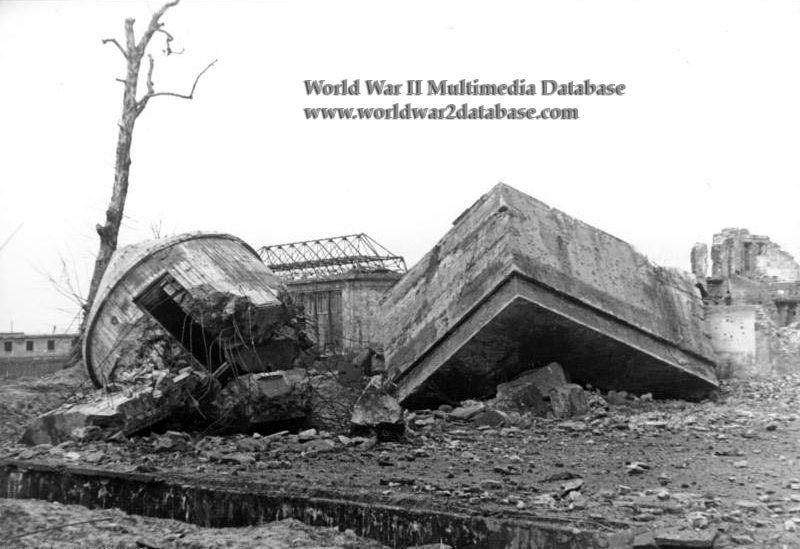 View of the surface installations of the Fuhrerbunker after they were destroyed by the Red Army in 1947. The bunker was a large, multi-story, multi-room air raid shelter begun in 1936 and finished in 1943. Hitler's quarters were actually the second level beneath the "Vorbunker" (upper or forward bunker) that housed rooms for Hitler's guards and communications. The Red Army occupied the bunker complex in April 1945, and arrested the few surviving inhabitants. This view was taken soon after the Reichskanzlei (Reich Chancellory) was destroyed. The site remained undisturbed until 1959, when the Soviets leveled the area. The site was in no man's land during the Berlin Wall era. In 1989, the site was investigated by West Germans for the first time. The photographer, Otto Donath, photographed Berliners in the late 1940s as they recovered from the war. Donath was a Kriegberichter ("War Reporter") as a photographer with Propaganda-Kompanie 689. He photographed the Minsk and Riga Ghettoes during the war before returning to Berlin and photographing everyday activities during the recovery. Some of Donath's photos were published in "Daily Look," published by Soviet military authorities in the middle of May 1945, the first newspaper to be published in Germany after the war. Deutscher Fernsehfunk (DFF), the state television broadcaster in East Germany, showcased Otto Donath's work in a 1965 documentary called Fotograf im Jahre 0 ("Photographs from Year Zero"). Donath's work was rediscovered in 2010 by photo editor Peter Kroh who published Donath's photos in Berlin Nach Dem Krieg ("Berlin After the War").